Creams «Morning of Queen», «White Waltz» and «Green Tango» were created by famous Russian scientist-biochemist S.A.Popravko, who opened chemical secret of "russian penicillin» in 1970th years - the best propolis for human skin with low degree of allergenicity and excellent protective properties. The Russian propolis known abroad as "russian penicillin" is a sort of «masterpiece» with optimal content of natural antibiotics and antioxidizers of wide spectrum of protective action. It is provided with combinations of components complementary to each other, such as: 5-7 types of bioflavonoids, phenolic triglycerids, aromatic non-saturated acids and their ethers. Such integrated activity concentrated in one natural source does not meet anywhere else in alive nature. Moreover these creams contain only natural «physiological lipids» - oils and components which are fully digested by skin cells. Among them: oil of nuts of siberian cedar, olive, peach, grape seeds and others, received exclusively by methods of cold pressing. The emulsion of the creams contains fresh bee wax saturated with ethereal oils of nectar-bearing plants. When contacting our skin they make active genes responsible for its maximum attractiveness, natural aroma and healthy appearance. Therefore they cause its especial light and beauty (« White Waltz», «Green Tango»). 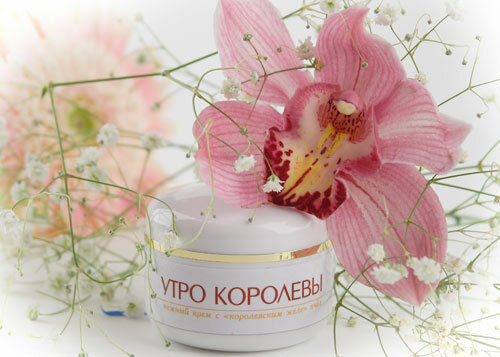 All creams contain such fractions of russian propolis, or «russian penicillin», which are the most effective natural antioxidants and ideally suit human skin. The emulsion is created from substances of the best quality, personally selected by the inventor. This is an absolutely ecologically clean remedy with full lack of parabens, perfume otduskas, structure-forming substances and conservants received in the artificial (chemical) way. It passes all necessary tests for safety, has a pleasant taste, can be accepted inside and put on mucous tissues. This new, especial food multi-purpose remedy is equally favorable both for our «external» body (for our skin) and for «internal» body - our gastroenteric path, internal organs and tissues and vascular system. The cream «Morning of Queen» also contains «royal jelly» of bees which returns to skin biochemical qualities of young age. It feeds the skin cells with necessary components providing maintenance of required level. The cream not only actively resists to ageing of a skin, but also rejuvenates an age skin - returning chromaticity and aroma. It is especially obvious for people older 45-50 years when concentration of sexual hormones in blood is reduced and both skin and body are under the danger of quick ageing and loss of immune properties which resist to "age illnesses», including so-called «illnesses of century». And first of all - condition of vascular system (system sklerotization). Ecologically clean emulsion of the cream, received on the basis of the fundamental scientific researches recognized all over the world is the novational, hi-tech gerontological cosmetics using the supreme achievements of evolution of public forms of life provided by melliferous bees. And finally, all creams are made on the technology developed by the inventor "by hands of the scientist-master" and are presented by compositions of individual manufacture. It is an original "alive natural cosmetics" of postindustrial level.